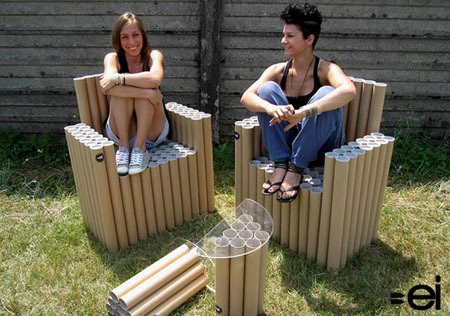 The FanTubes Furniture is a fun use of often discarded cardboard tubes. The hundreds of waste tubes have been constructed together to create striking pieces of furniture, that though they may not be that comfortable certainly offer a room a talking point. The FanTubes concept has been created by Italian designers Paola Argine and Cristina Alzati, who form the company double-ei. 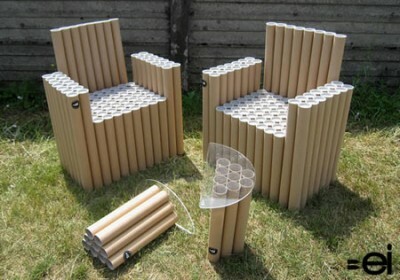 The sustainably produced cardboard tubes that are often used by designers, architects, artists and students have been re-purposed and fashioned into chairs and tables using wire and plexi glass. Anything that can help prevent these tubes ending up in landfill has many environmental benefits, though these cardboard tubes could be recycled rather than re-purposed in this manner. There is something appealing about waste materials being reused in this way, and although these chairs would be rather uncomfortable (even with cushions) they do help to demonstrate the potential and strength tubes such as these have together.